NEA Baptist–meets all criteria as a Comprehensive Center according to national quality standards established to deliver safe, high quality bariatric patient care. Jonesboro, Ark. January 15th, K. Bruce Jones, MD, FACS, Metabolic and Bariatric Surgery Director at NEA Baptist, announces the bariatric surgical center has been accredited as a Comprehensive Center under the Metabolic and Bariatric Surgery Accreditation and Quality Improvement Program (MBSAQIP®), a joint program of the American College of Surgeons (ACS) and the American Society for Metabolic and Bariatric Surgery (ASMBS). NEA Baptist recently received new designations as a Blue Distinction Center by BCBS, which recognizes a proven history of delivering exceptional care and results. United HealthCare also recognizes NEA Baptist for its quality of care as a United HealthCare Center of Excellence. Both designations create a local option for patients who carry these medical plans and are interested in bariatric surgery. Patients seeking surgical treatment for severe obesity and its related conditions have a high-quality choice for receiving treatment at a nationally accredited program that meets the highest standards for patient safety and quality of care in northeast Arkansas. To earn the MBSAQIP designation, NEA Baptist met essential criteria for staffing, training and facility infrastructure and protocols for care, ensuring its ability to support patients with severe obesity. NEA Baptist also participates in a national data registry that yields semiannual reports on the quality of its processes and outcomes, identifying opportunities for continuous quality improvement. “Lots of people worked really hard to achieve this level of expertise. 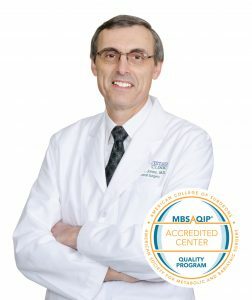 This designation means we can offer weight loss surgery with the same high standards of safety and success found at the best centers in the world,” says Dr. Jones. Dr. Jones is a graduate of Vanderbilt Medical School and has performed bariatric surgery since 1989. He is certified in surgery by the American Board of Surgery and is a Fellow of the American College of Surgeons and a Fellow of the American Society of American of Metabolic and Bariatric Surgeons and Database. Dr. Jones is a member of the Society of American Gastrointestinal and Endoscopic Surgeons. NEA Baptist Clinic hosts free educational seminars on surgical weight loss options, nutrition classes and support groups each month. During the seminars, Dr. Jones addresses the benefits and risks of weight loss surgery and its growing use for the treatment of morbid obesity. Support groups present weight loss patients with a forum to openly discuss any problems or concerns regarding weight loss surgery. A variety of topics will be discussed with frequent guest speakers. For more information about nutrition classes, support groups and seminars visit https://neabaptistclinic.com/weight-loss/ or contact Gayla Smith at 870-936-8000 or by email at gayla.smith@bmhcc.org. NEA Baptist’s commitment to quality care begins with appropriately trained staff and the leadership surgeons who participate in meetings throughout the year to review its outcomes; seeking continuous improvement to enhance the structure, process and outcomes of the center. NEA Baptist Health System comprises NEA Baptist Memorial Hospital, NEA Baptist Fowler Family Center for Cancer Care and NEA Baptist Clinic, northeast Arkansas’ largest physician group. The 228-bed hospital offers cancer care, heart care through the Heart Center, labor and delivery services through the hospital’s Women’s Center, as well as a number of inpatient and outpatient services, emergency care, and surgical services including weight loss surgery, neurology, respiratory care, and pulmonary rehabilitation. NEA Baptist Clinic’s over 100 physicians practice in more than 35 specialties and offer a wealth of services, from pediatrics to orthopedic services.